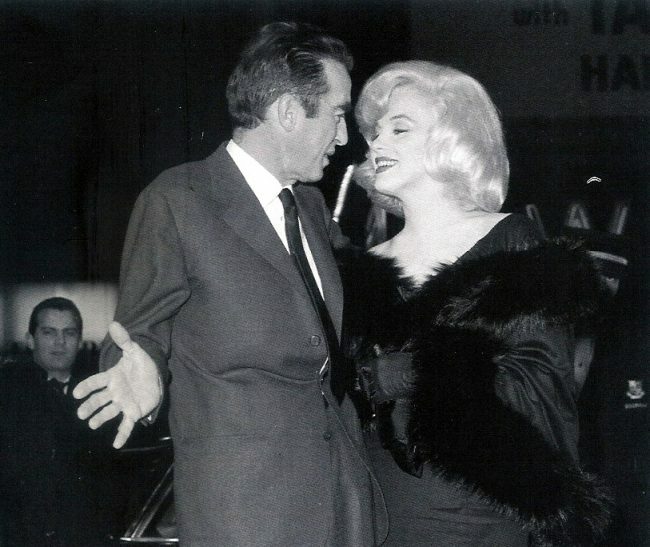 Several Marilyn-related items are on offer, including a 1950 memo from Twentieth Century Fox to filmmaker Joseph L. Mankiewicz, confirming her casting as Claudia Caswell in All About Eve; and her contract for Horns of the Devil, a property she purchased in 1954. 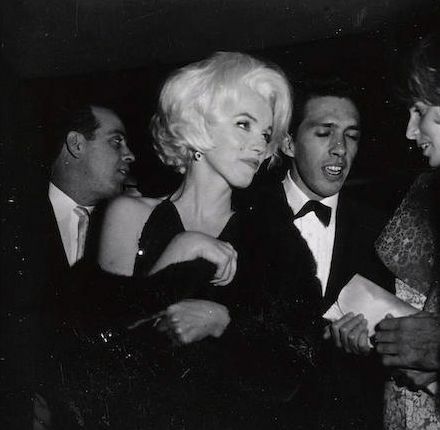 There is also a group of rare photographs, including some taken by amateur photographer Janice Sargent at a children’s hospital benefit in 1953, and one photo from the 1962 Golden Globes. 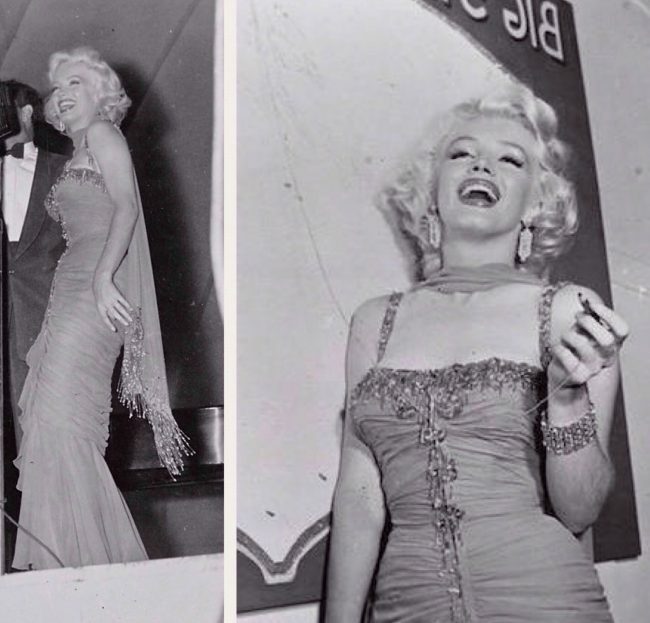 Two photos of a visibly pregnant Marilyn with husband Arthur Miller, taken by Sargent during filming of Some Like It Hot in 1958, are also featured. 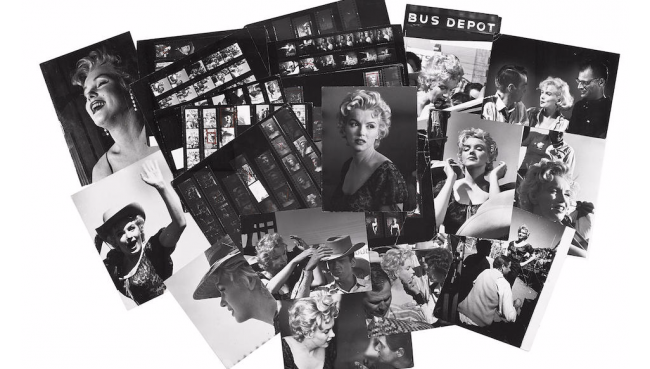 Another lot contains several photos taken during filming of Bus Stop, and an interesting photo of Marilyn and Arthur visiting Montgomery Clift on the set of his 1958 film, Lonelyhearts. 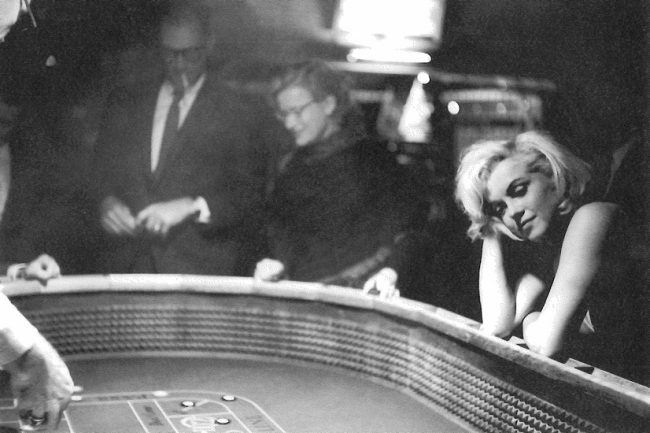 Marilyn was working on Some Like It Hot at the time, also on the Samuel Goldwyn Studio lot. 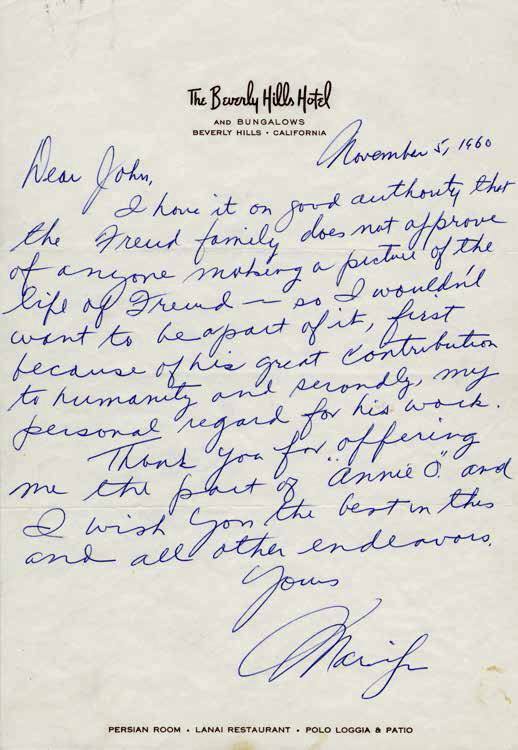 This letter from Marilyn Monroe to John Huston, in which she rejects a part in the director’s planned film on Sigmund Freud (from the Margaret Herrick Library of AMPAS), was posted today by James Grissom on the Follies of God Facebook page. The letter was also discussed recently on the Stars and Letters blog. Marilyn was advised against this project by her controversial psychiatrist, Dr Ralph Greenson, who had just begun treating her and would do so until her death, less than 2 years later. He was in contact with Anna Freud, who objected to the film being made. Marilyn had seen her as a patient a couple of times, and would leave part of her estate to the Anna Freud Children’s Clinic in London. 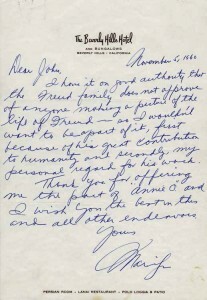 Monroe wrote to Huston on November 5, 1960 – shortly after they completed The Misfits. Although I strongly believe she had the capacity for more serious work, I think this role would have been traumatic for her personally. 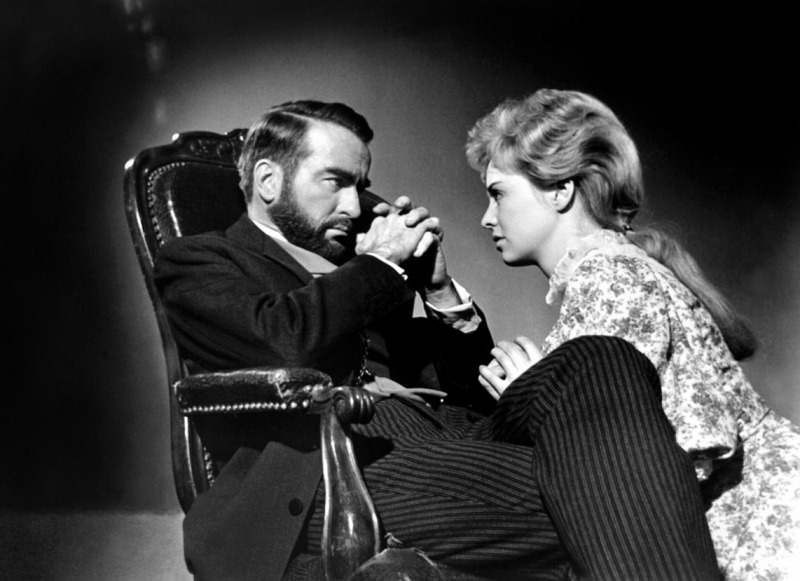 It certainly was for Montgomery Clift, as he clashed with Huston many times during filming. I have it on good authority that the Freud family does not approve of anyone making a picture of the life of Freud– so I wouldn’t want to be a part of it, first because of his great contribution to humanity and secondly, my personal regard for his work. Thank you for offering me the part of ‘Annie O’ and I wish you the best in this and all other endeavors. ‘The Long Suicide of Montgomery Clift’ – an extract from Anne Helen Petersen’s upcoming book, Scandals of Classic Hollywood – is published at Vanity Fair today. 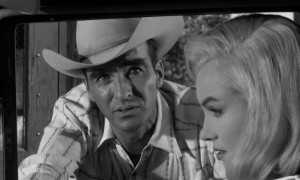 “Clift appeared in The Misfits, a revisionist western best known as the final film of Marilyn Monroe and Clark Gable. The director, John Huston, supposedly brought in Clift because he thought he’d have a ‘soothing effect’ on Monroe, who was deeply embroiled in her own addictions, with her own personal demons. 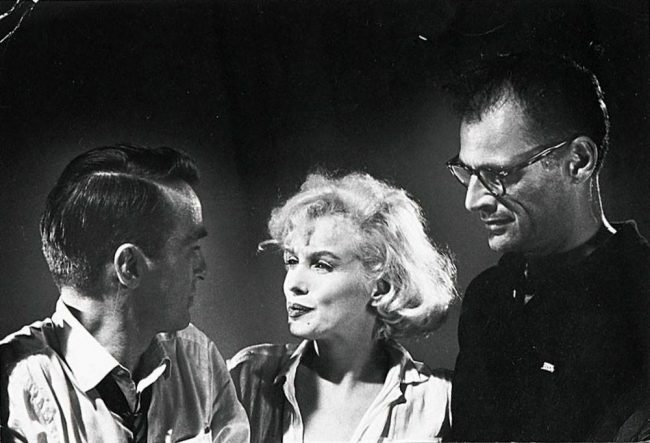 But even Monroe reported that Clift was ‘the only person I know who is in even worse shape than I am.’ The pictures from the set are as poignant as they are heartbreaking: it’s as if all three were meditating on their respective declines, and there’s a sad, peaceful resignation at the difference between what their bodies could do and how people wanted to remember them. 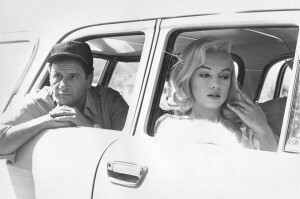 Yesterday we learned of the death of Marilyn’s friend and co-star, Eli Wallach. At 98, he was one of America’s finest character actors. 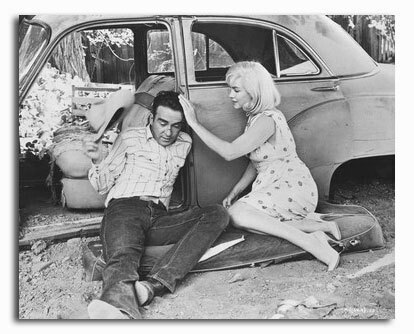 I will post a longer tribute soon, but for now here’s a great review of The Misfits from Carley Johnson over at the Black Maria blog – a movie that was so greatly enriched by Eli’s performance as the likeable, but untrustworthy Guido. While Marilyn, Clark Gable, Montgomery Clift and Thelma Ritter all died within a few years of making The Misfits, Eli went on to even greater triumphs – winning a lifetime achievement Academy Award in 2010, the same year his last movie was released. “By 1961, the Hollywood Studio System had begun a slow rot from the inside out which would, by decade’s end, see to its total collapse thus ending the Golden Age of classical Hollywood. The Misfits, directed by John Huston and penned by Arthur Miller, is a fascinating relic from those years in flux that bewildered its audiences just as much as it bewildered the execs. On paper, the words Clark Gable (the king), Marilyn Monroe (the queen) and Montgomery Clift (the rebel) looked like box office magic. The result is a mixed bag that would be Gable and Monroe’s final film, and one of Clift’s last. Miller masquerades a deeply intimate, and highly modern, character study under the guise of a Western romance. It was no secret that Miller wrote the screenplay for his wife. The role of Roslyn could have been played by anyone, sure, but perhaps no other performance would have been nearly as truthful. 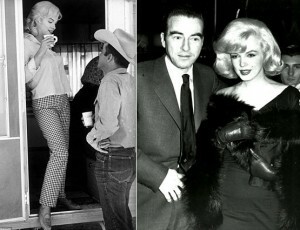 Marilyn Monroe, Montgomery Clift and Eli Wallach were all Method actors. 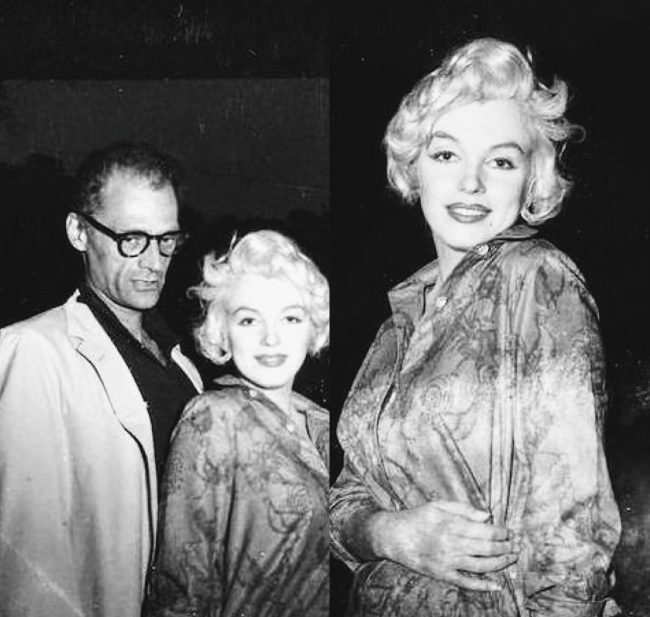 Monroe’s close friend and acting coach happened to be Paula Strasberg who was a constant presence on the set. Gable came from a more… square shooting school of acting, perhaps best summed up by Jimmy Cagney: know your mark and know your lines. There is no denying the fact that The Misfits proved enormous strain on Gable, physically and emotionally. But. Be that as it may, the truth is, The Misfits didn’t directly kill Gable anymore than the Kennedy’s killed Marilyn. The strenuous Misfits shoot did not cause Gable’s premature death– but at the same time, cannot be disqualified as one of its many contributing factors. 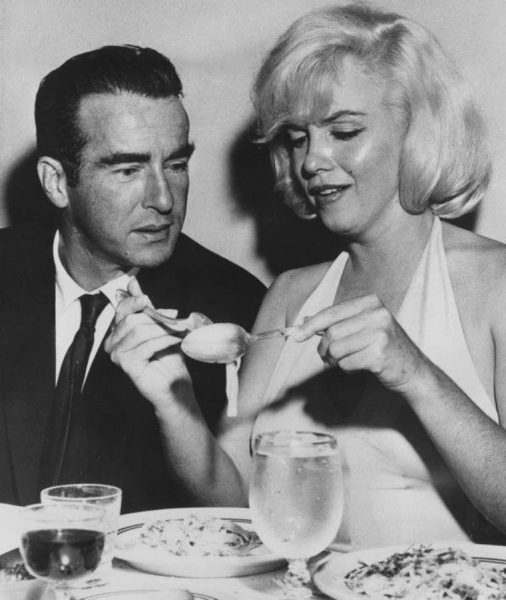 Entertainment writer Liz Smith pays tribute to Montgomery Clift in her latest post for New York Social Diary. “I didn’t know Montgomery Clift but when I was a young movie magazine editor for something called Modern Screen I often begged the editor-in-chief to write about him. I knew he was talented. But the editors stuck with Tony Curtis. I went on to know more about Clift because my straight brother, Bobby, worked as a waiter in a gay cafe on Christopher Street. He often served Clift and always told me after about how unhappy he seemed. “He gave big tips!” said Bobby, who even then had a live-and-let-live attitude. I finally saw Montgomery Clift in person, with Marilyn Monroe, at the New York premiere of The Misfits. They sat right in front of me, enjoying each other like real friends. I was mostly stunned by how gorgeous she looked in a black fox fur. It was a privilege to see them even once. 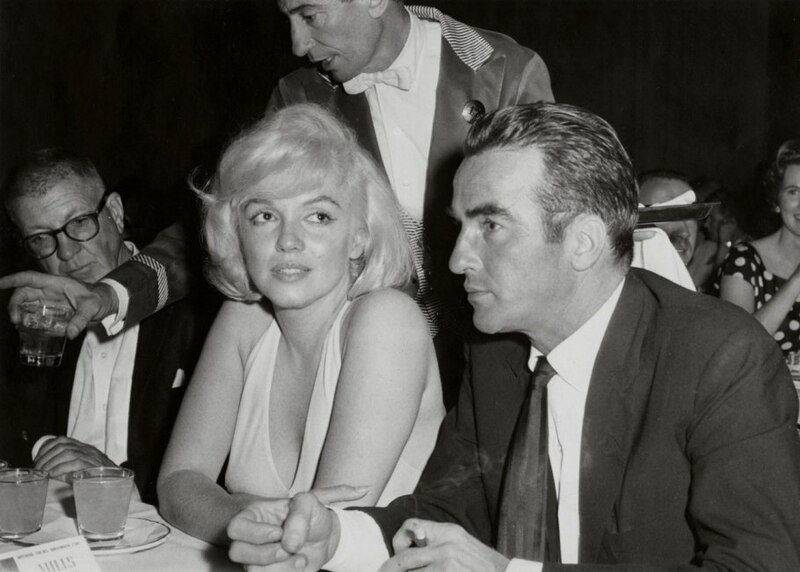 This candid photo of Marilyn with her co-star and dear friend, Montgomery Clift, from the late actor’s private collection, is featured in a slideshow over at Vanity Fair‘s website. The Montgomery Clift Archive is now stored in the New York Public Library.